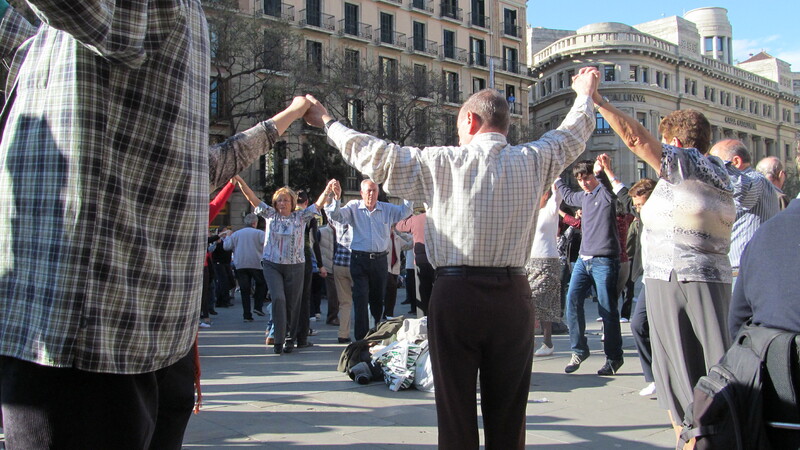 I had spent a pleasant hour in the square in front of the Gothic cathedral in Barcelona enjoying La Sardana, the traditional folk dance of Catalonia. A few days later I booked into a rural hotel, in a house built in the 1760s complete with a fortified tower from the 13th century. I was within an hour of the Mediterranean and on the edge of the foothills of the Pyrenees, and an hour north of the medieval city of Girona. Why would anyone ever want to leave? I know why I am planning to return to this area at the end of October for four days. I headed to the seaside town of L’Escala, definitely a downscale holiday town, a few hours north of Barcelona along the Costa Brava; the streets were not lined with chi-chi boutiques and restaurants. The hotels all looked like they were family-run. 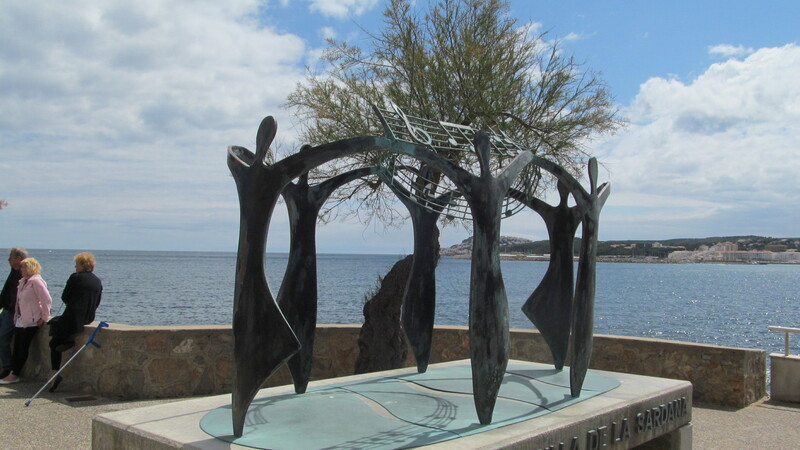 While walking the promenade I discovered two amazing sculptures, both celebrating La Sardana. The first was a stylized circle, suggesting the movement of the dancers. I was entranced. The sea, the sky, the 20 degree weather, another example of the Spanish delight in the visual. I continued my walk, building an appetite for lunch. And this is what I discovered within 100 metres. A lifesize recreation of the traditional band. 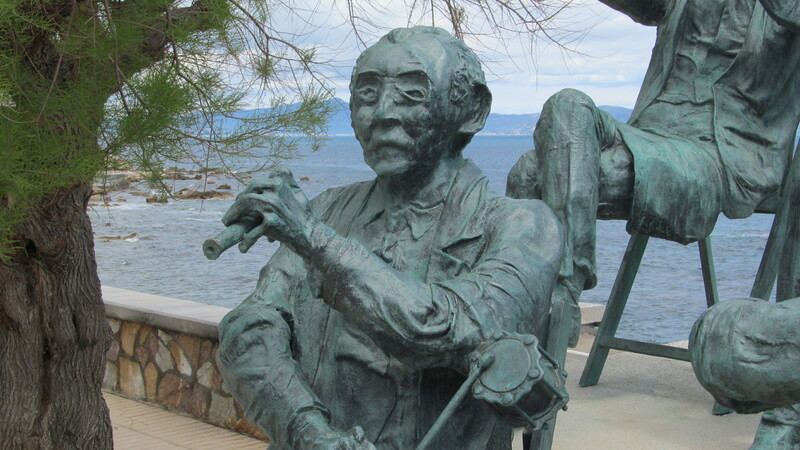 I am sure than the sculptor had been inspired by the musicians of the village of L’Escala, the tradesman and fisherman who have been there in the village square for festivals that mark out each year’s calendar and who have been doing this over many years, many or most probably following in their fathers’ steps. Look at the face of the leader, like the one we saw in Barcelona playing the piccolo keeping beat with the small drum attached to his elbow. Each figure shares the time-and-weather-worn face of a people who have made their living at the edge of the sea. This is a brilliant work of art, a celebration and confirmation of tradition and of community, and of the essential role of music in their lives, in our lives. 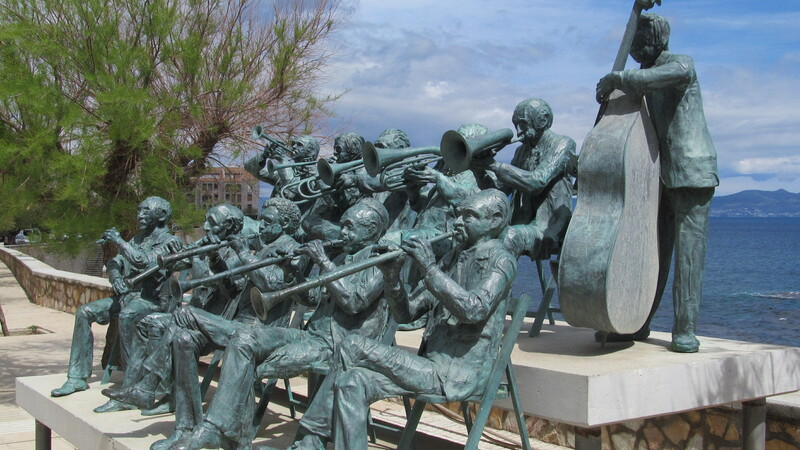 The two sculptures, that of the dancers and of the musicians, are separated by a 100 metres or so but easily appreciated and understood as a time honoured unity. I would have loved to have included all the other close-ups of these amazing faces and hands. The walk around the promenade did the necessary appetite magic; in an outdoor cafe I discovered for the first time what all the paella fuss is about, by finally being offered the “other” paella, not the Valencian variety made with saffron, but the darker, far more savoury Paella Marinara. But that is possibly a story for another post. I am going to leave you with two links to youtube where I have posted two very short videos I took that day in the square in Barcelona. In the first one you will see the dancing, the band and the facade of the cathedral. 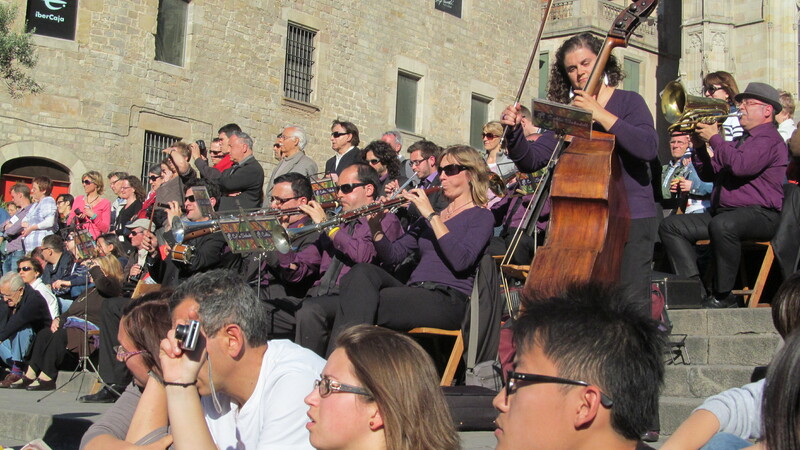 The second one is a close-up of the band with the focus on the haunting sound of the elongated woodwind instrument that is part of every La Sardana band. Enjoy and hopefully the photos and the youtube links will be successful. You can always cut and paste each link in your address box. The other option would be to go to youtube agnotarte; there you will find about a dozen of my short videos from various trips to Spain including the two Sardana ones. I am very new to this game. Very soon, new posts will include the videos; it will simply be a case of clicking on the arrow to see them. This entry was posted in Uncategorized on September 15, 2012 by agnotarte.